"A gem of a novel, providing a deep and satisfying journey with flesh-and-blood characters, excellent writing that occasionally soars to memorable heights, and a fearless exploration of the complexity of falling in love with a person who, while irresistible and reciprocal, is also attached to a dear friend who deserves loyalty. Highly recommended!" The Columbia Review. 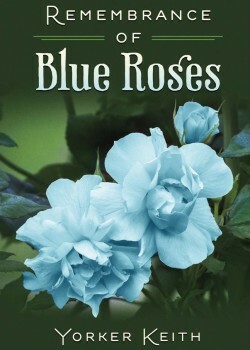 Remembrance of Blue Roses by Yorker Keith is an eloquent and emotional novel revolving around a love triangle with a twist, featuring multi-national characters and locales while maintaining a taught yet substantive and satisfying storyline. The first question must be answered first: Why the Blue Roses? As a story anchor, the title relates not only to the fact that love triangles commonly involve an emotional rollercoaster peaking with rosy hopes and dropping sharply into feeling blue, but also to actual roses. At a pivotal point in the story, the main protagonist, Mark Sanders, and his colleague, Hans Schmidt, the husband of Mark’s love interest, Yukari, plant blue roses in the garden of the U.N. building as an expression of their lasting friendship. If this sounds confusing, fear not, for the novel truly excels in untying tangled emotions, rationalizing illogical passions, and elucidating unreasonable actions. At its core, Remembrance of Blue Roses is a story of a man torn between art and career, friendship and betrayal, sins of the past and desires of the present. Mark is far from a seducer or manipulator. Rather, he is a fervent lover in a very complicated situation, who is honest enough with himself to analyze and contemplate his past, present and future choices (sometime to the point of obsessing). Author Yorker Keith achieves great realism by letting us see what’s inside Mark’s head, as well as what his eyes and ears experience—in New York City and beyond. His love for Yukari is only enriched by his passion for music (Yukari, a Japanese women, is a professional violinist), visual arts, international justice, and people. Adding to the novel’s uniqueness is the window it opens into the complicated lives of men and women working at the U.N. and its international agencies (with realistic story threads involving the U.N. peacekeeping efforts in Sarajevo, as well as the Israel-Palestinian conflict and the Holocaust). The relationships are convincingly fleshed out with past lovers and spouses, some reattached, professional ties and conflicts, and the always-lingering regrets over past choices. In summary, this is truly a gem of a novel, providing a deep and satisfying journey with flesh-and-blood characters, excellent writing that occasionally soars to memorable heights, and a fearless exploration of the complexity of falling in love with a person who, while irresistible and reciprocal, is also attached to a dear friend who deserves loyalty. Highly recommended!